As hard drive capacity crossed the meager 2 GB threshold, operating system developers saw the need for a file system architecture that made better use of available disk space. Out of this need, Microsoft developed the New Technology File System or NTFS for short. NTFS was designed to supersede the File Allocation Table or FAT architecture. Depending upon the operating system you have, and where the operating system was loaded, your computer may have an NTFS partition on its hard drive. But what happens if you’re working out of a FAT 32 file system with a compatible operating system that doesn’t talk to NTFS? You’d have a hard time retrieving any NTFS data. 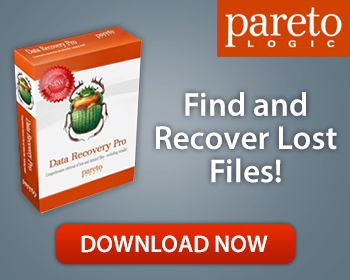 Enter ParetoLogic’s Data Recovery Pro. If you’ve lost data stored in an NTFS environment, the first thing you should do is check to see if your operating system can interact with NTFS. If it can, you look should look in the recycle bin for your missing files. Perhaps the file is still there; in which case recovery is a simple matter of selecting the restore file option. A peek in the recycle should always be your first stop. If you don’t see the file in the recycle bin, a general Windows search may find your missing files. What If My Operating System Doesn’t Support NTFS? If your operating system can’t naively interact with NTFS, look to a file recovery suite like ParetoLogic’s Data Recovery Pro. Data Recovery Pro is a software suite that can find and restore lost emails, files, email attachments, and even files on external drives using NTFS. Just as in an FAT32 environment, Data Recovery Pro works on the premise that deleted files aren’t immediately removed from the hard drive. Instead, the operating system marks the space where that file was located as now being available. The old file is still where it was, until new information is saved to that location. If you use the software before the operating system writes over the file, the original data can be recovered. Data Recovery Pro works in FAT and NTFS environments adding value for users who switch between formats depending on how and where their information is saved. Because your computer constantly writes to the hard drive to cache information, each activity runs the risk of deleting the NTFS data you wish to recover. STOP USING YOUR COMPUTER! Do not cycle the power to your computer before trying to recover NTFS data. Your next move should be to download Data Recovery Pro. After you’ve installed it, the simple user interface can put your NTFS data back in reach so long as it hasn’t been overwritten. As operating systems continue to evolve and interact with different file systems ParetoLogic’s Data Recovery Pro provides a means to recover data from multiple file system environments. If you can’t recover NTFS data with your current applications, download Data Recovery Pro.